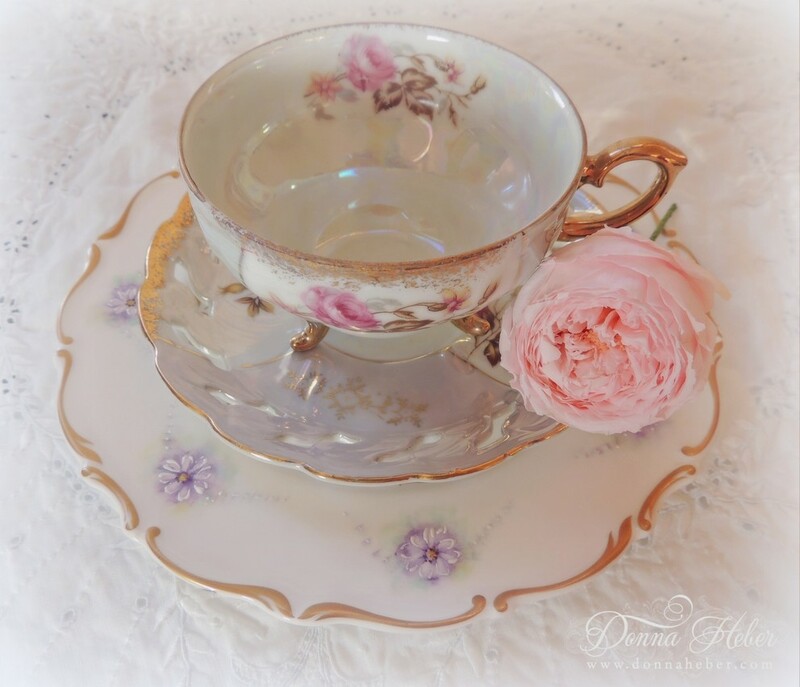 I can never resist a pretty piece of china! 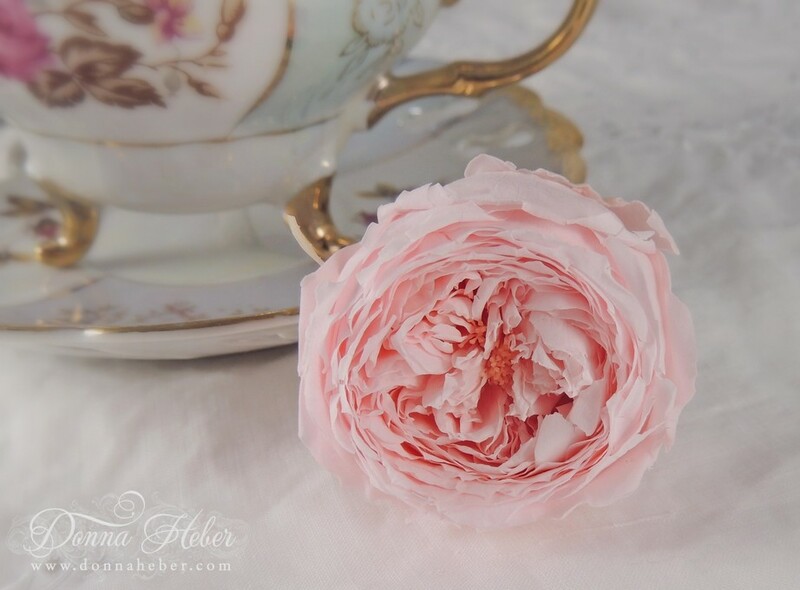 Anything pink or purple always catches my eye and I love to mix and match them for a unique tablescape. 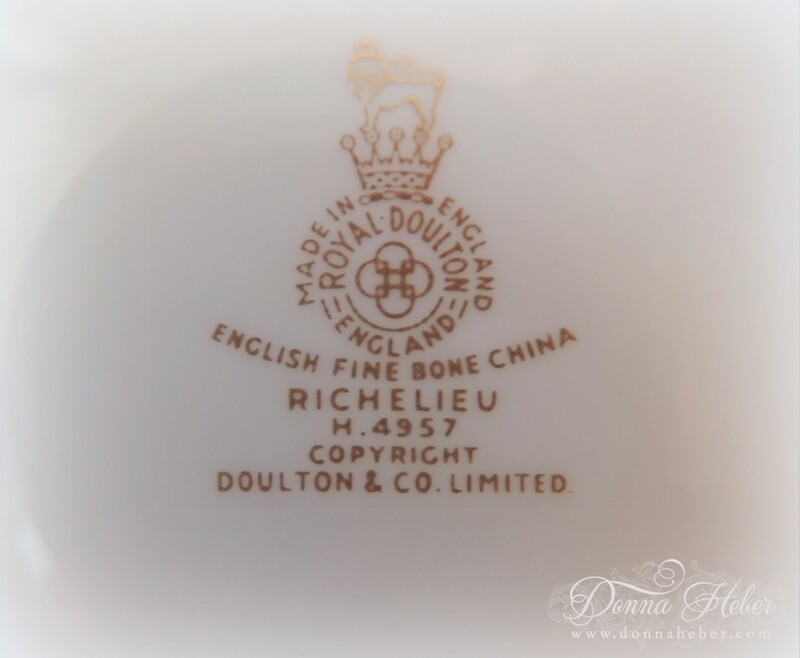 Today I am sharing with you a Royal Doulton Richelieu plate from England. The pattern is H4957. 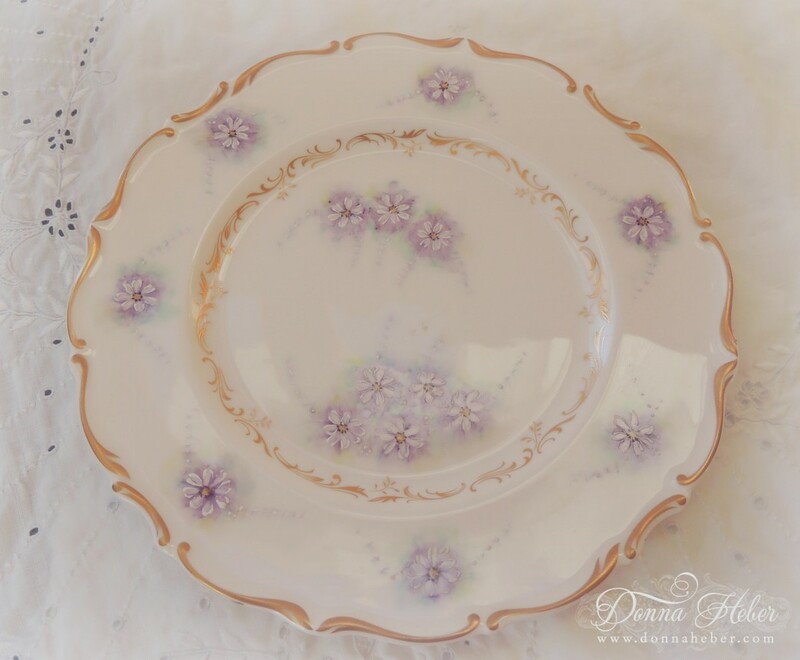 What makes this piece so special are the hand painted daisies with a soft lavender background. I also love the elegant gold scrolls and leaves. It has such a pretty backstamp. 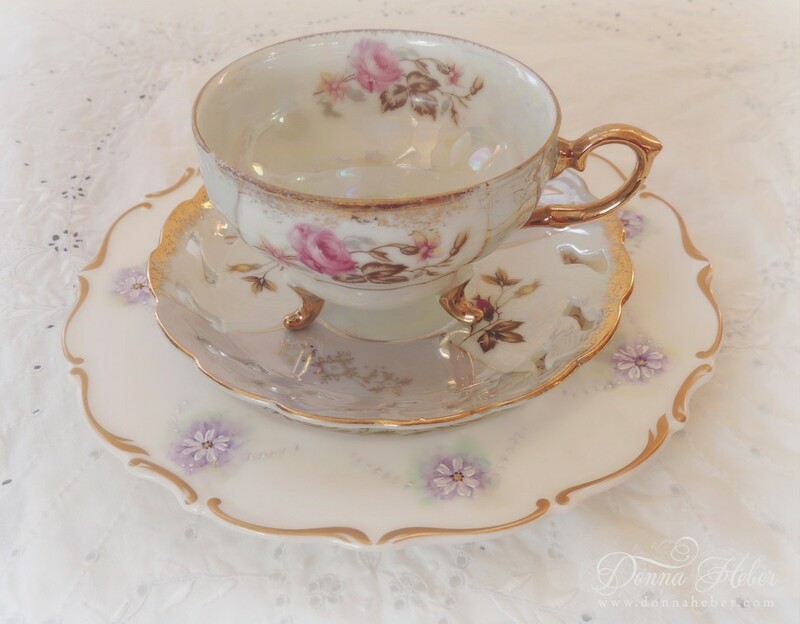 I've paired it with a vintage lusterware teacup and saucer from Japan. Another wonderful find with a footed base! 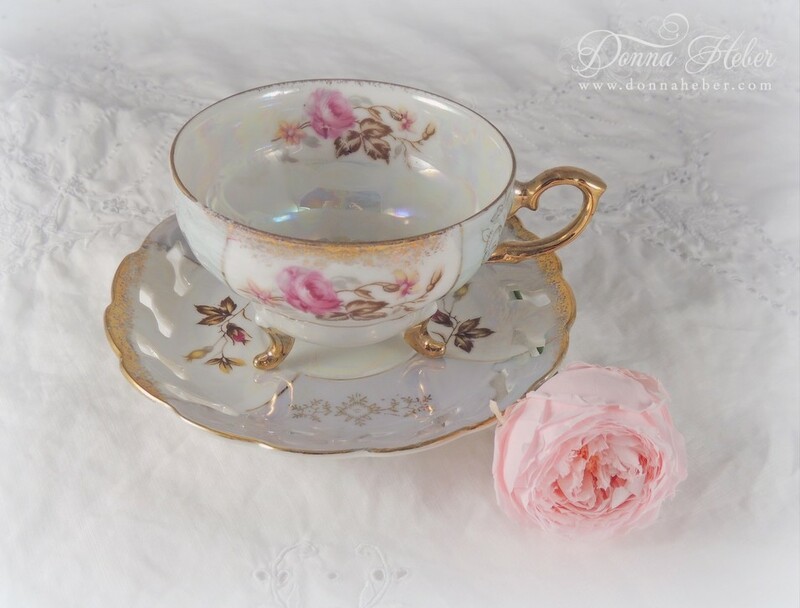 The kettle is on and I will be sipping an enchanted white rose blend. 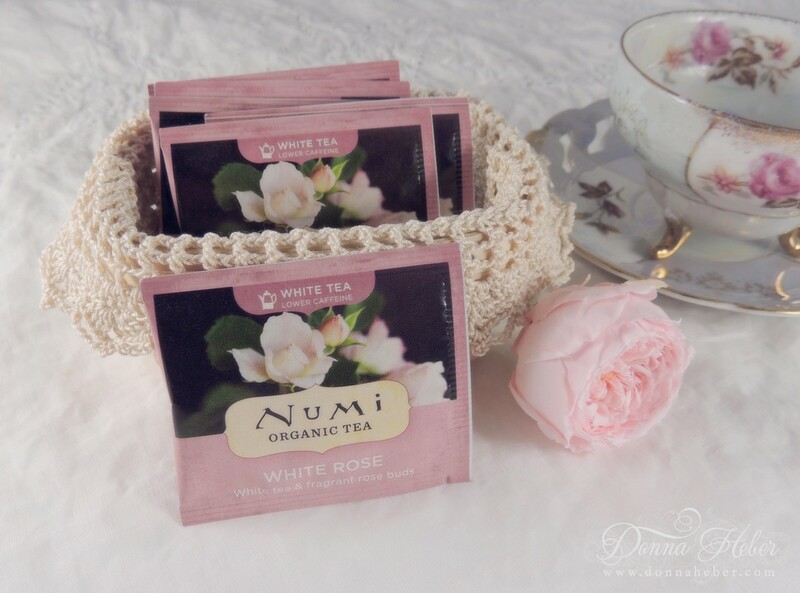 I always look forward to tea time and trying different teas, but somehow I tend to keep going back to my favorite white rose. Perfect for a spot of tea on a cold day. With all the snow we have received I find myself dreaming about springtime. Wishing you a blessed Sunday. I want to thank everyone who entered my Grow Your Blog giveaway. It's finally time to announce the winner. 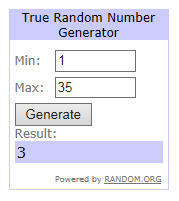 The winning # using random.org was 3 - Merle from Merlesworld. 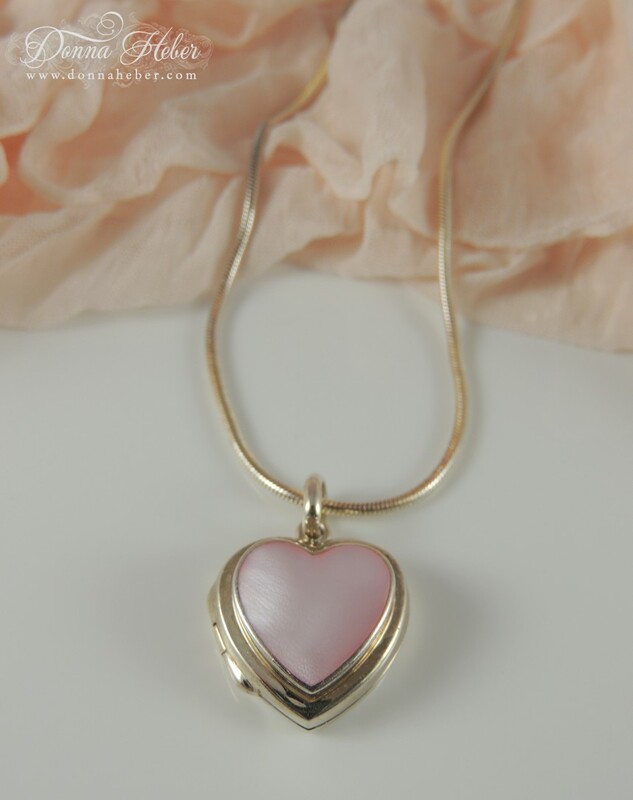 Congratulations Merle, I have sent you an email so if you could please respond with your address I will get this pretty heart locket in the mail to you. Thank you to all those who entered and for taking the time to leave a comment on my GYB post. I'm hoping to enjoy a relaxing day with some crafting. Poor hubby will have to clean more snow. To all my friends in the Northeast - stay warm! Happy Super Bowl Sunday! Before the game gets underway, I have a Valentine's Day card to share with you using some Memory Box supplies. I wanted to create a subtle background using the Adornment stencil. A piece of Very Vanilla paper was cut to size; I placed the stencil over it and spritzed the background using Tattered Angels Glimmer Mist in Iridescent Gold - Ooh La La, how pretty! It's extremely difficult to see in the photo, but the pattern is there. Next, I cut and assembled the Palace Oval Frame and popped it up off the background. 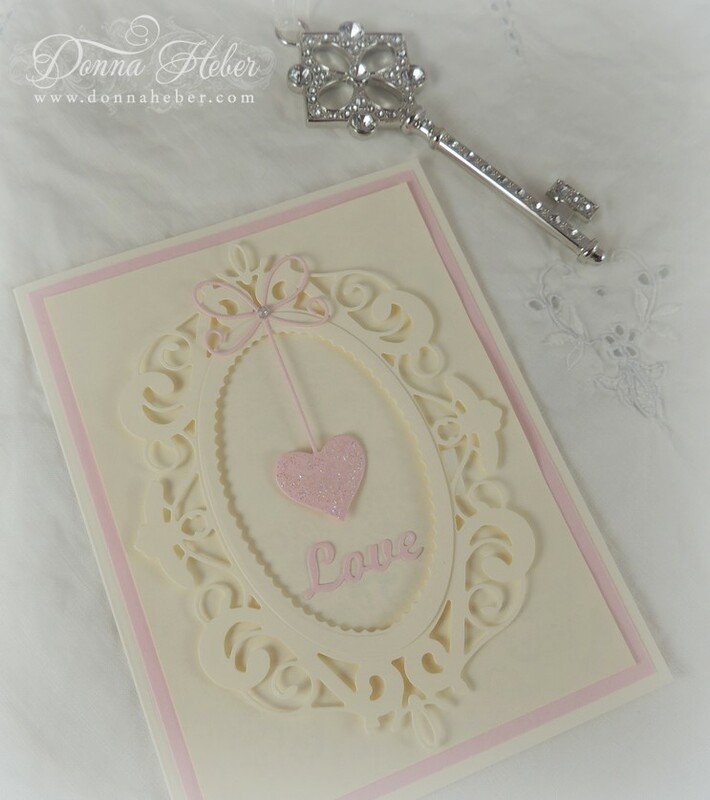 A precious heart was cut from Pink Pirouette paper. Of course, I had to add some Star Dust Stickles to it. A silver rhinestone accents the bow. 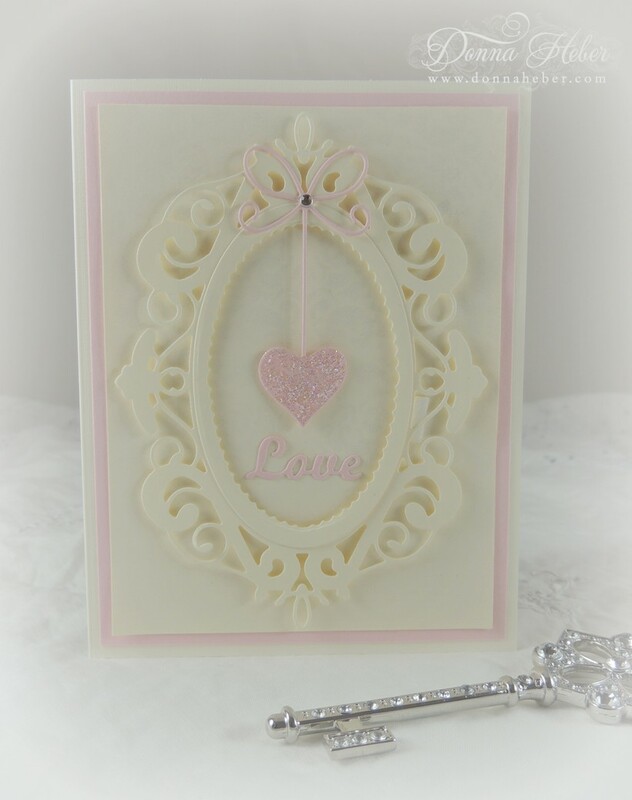 The word love was cut using an Elizabeth Craft Designs die. I like how it fits perfectly in the frame. 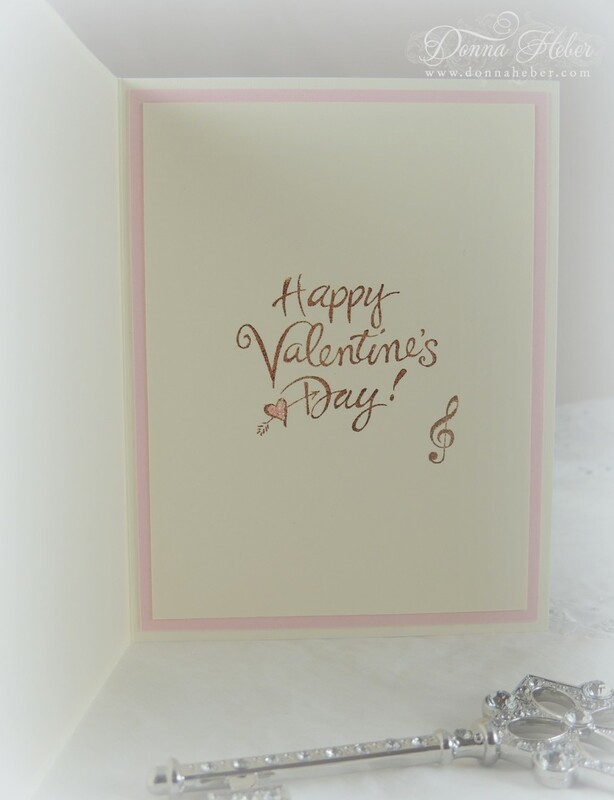 Happy Valentine's Day was stamped and embossed using Close to Cocoa ink. The little heart was filled with Cotton Candy Stickles. I thought it needed something else so I added a musical note. Enjoy the game tonight. I really don't care which team wins. Do you have a favorite? We are going to a friend's house who always puts on a spread. They are predicting more snow this evening. Here's hoping the drive to work in the morning won't be too bad.